Remember when Thom Yorke’s brother had a band? My relationship with this band and their music is a conflicted one. As a big Radiohead fan, I heard about the Unbelievable Truth earlyish (when Higher than Reason came out – I missed the group’s first release for Shifty Disco and their first single on EMI, Stone) and got all the singles they put out in the run-up to the release of their first album, Almost Here. As an acoustic-guitar-playing wannabe songwriter, I heard in their music a sound that I found inspiring and which I wanted to emulate. I liked the mix of acoustic guitars, organs, vocal harmonies and a rock rhythm section. Nigel Powell, the drummer, played with sticks and obviously came from a background in rock. He wasn’t a brushes-wielding jazzer or a rimshot merchant, and I liked that. Rock drumming was the only kind of drumming I understood. Obviously there are other artists whose music combines these instrumental textures (there’s nothing that UT did on Almost Here that, say The Beatles didn’t do 35 years before on I’ll Be Back), but these guys were the first ones I heard, and I was an early adopter. So I retain a fondness for them, but for years I didn’t listen to them. At some point, I became aware of the juvenility of Yorke’s lyrics (there are clunkers in nearly every song) and after that I couldn’t listen to the band any more. All I could hear was the bad stuff. That this was unfair goes without saying. Rock music has thrown up many worse lyricists, and anyway, I’m not one of those listeners who respond primarily to lyrics – tunes, chords, rhythms, sonics, lyrics, in that order – and bad lyrics have never seemed a good reason for dismissing a band or song. But something about Yorke’s overwrought mopiness was hard to forgive. Namely that, as a serious-minded, inward-looking 16-year-old, I hadn’t seen it, had accepted it unquestioningly. Recent missteps, as has been said by many an intelligent commentator, embarrass us far more than ones made years ago. Now, 17 years (!) after it came out, I can hear Almost Here as a collection of more or less pretty songs, with a standout moment in basically every track. I still like Settle Down and Angel in their entirety; the “You can’t send it along” climax of Solved is suitably rousing; Same Mistakes’ middle eight (“Leave it on the table”, where the harmony vocals are all phased) is a great little passage; Forget About Me sounded much better than I remembered; the middle eight of Stone, where Yorke sings “None of this is harder than knowing about you” again, but the chords change to a minor key, is very cleverly written; and Higher than Reason is still a cracking riff let down by an awful lyric. What I enjoyed most, though – indeed boggled at – were the mixing and mastering jobs (I am capable, if that’s the headspace I’m in, of listening to and appreciating music purely on that level). Almost Here‘s production was the work of the band’s drummer Nigel Powell, producer and mix engineer Jeremy Wheatley (now a big-name guy) and various second engineers. They did a stellar job. All records that include as their dominant components acoustic guitars and drummers create an unreality. Don’t get what I mean? Then I invite you to come over to my place with your acoustic guitar, I’ll set up my drum kit, and we’ll play a few tunes together. Except, we won’t, as I won’t be able to hear you. And you won’t be able to hear you either. One ping on the ride cymbal will be all it takes for me to drown you out for a bar or two. As music listeners we are, consciously or unconsciously, aware of the fictions that are created in the name of art. Engineers use microphones, equalisers, compressors and pan pots to create events that didn’t happen, that couldn’t happen. One of the subtle, but most pervasive, is the placing in fixed and unchanging audibility of an acoustic guitar when the mix is full of other, naturally louder, things, like drums. That delicately picked acoustic guitar intro? Well, if I get my compressor out and do some automated fader moves, it’s just as loud against the vocal (or bass guitar, or snare drum or whatever) as the powerfully strummed acoustic guitar in the chorus! Actually, the total, fixed and unchanging audibility of every element within a mix is a recentish development in rock mixing. Even in the 1990s, mix topologies reflected reality a little more than that, and Almost Here is a great example. The acoustic guitar picking that leads off Stone and Forget About Me, not to mention the quietly strummed acoustic at the start of Building*, are by today’s standards ludicrously quiet. No major label would let a mix engineer turn in work that the mastering engineer couldn’t easily smash. Wheatley’s mixes were unsmashable, and therefore stayed unsmashed. You couldn’t compress, say, Stone, so that opening guitar was around -12 or -13dBFS without turning the louder sections of the song into something that sounded like Iggy’s remix of Raw Power. Listened to from the vantage point of 2015, it’s glorious. Unbelievable or otherwise, that’s the truth. 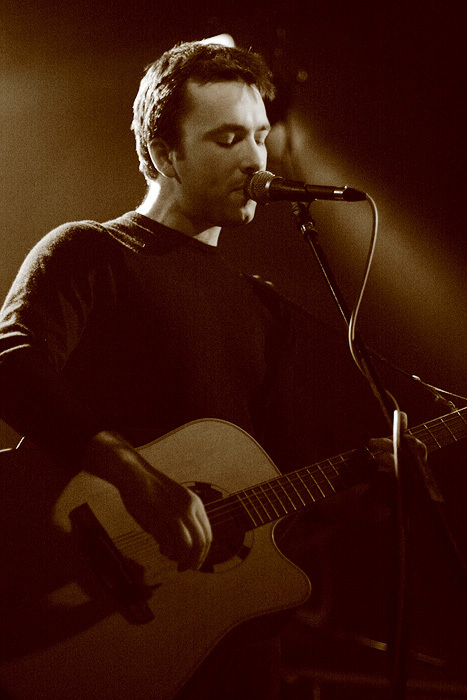 Andy Yorke – Takamine EN10s were everywhere in the late 1990s. I still play one! *Powell, for instance, ended up playing drums for the reactionary goon Frank Turner. **The first chord of Building peaks (peaks!) at -32.8dBFS, and that’s in the left channel, where it’s a good 10dB louder than it is on the right. The loud section at the end averages -11.5dBFS. As I say, no one has turned in a mix this dynamic to EMI since. This entry was posted in Music and tagged 1990s, A Hard Day's Night, acoustic guitar, Almost Here, alternative rock, Andy Yorke, Angel, Audio Engineer, audio engineering, bad lyrics, Building, compression, Drums, EMI, fashion in mixing, Forget About Me, Frank Turner is a reactionary goon, harmony singing, Higher than Reason, I'll Be Back, Iggy Pop, Jimmie Vaughan, lucidity in mixing, lyrics, mastering, mixing, mixing acoustic guitar and drums, Nigel Powell, organ, oxford, Radiohead, Raw Power, record production, Same Mistakes, Settle Down, Shifty Disco, singer-songwriter, Solved, songwriting, Stone, The Beatles, Thom Yorke, Unbelievable Truth on September 11, 2015 by rossjpalmer.